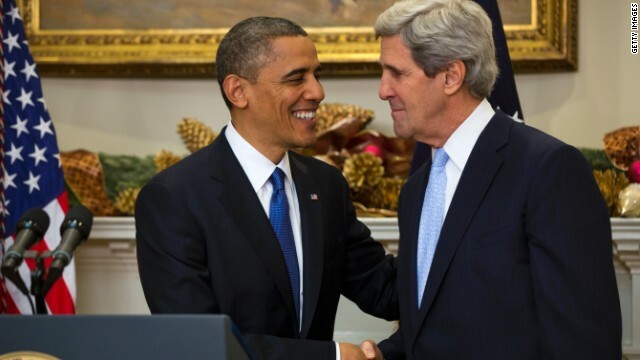 Washington (CNN) - President Barack Obama and Secretary of State John Kerry made explicit the administration's renewed attempts to negotiate a peace deal between Israel and Palestine Saturday as the United States begins to assume a more muscular role in talks. At the Brookings Institution's annual Saban Forum on Middle East issues and U.S.-Israeli relations, Obama and Kerry each spoke about a budding interim deal that would work towards a two-state solution. "Peace is possible today," declared Kerry, who just returned this week from his eighth trip to the region. There, he met with Israeli Prime Minister Benjamin Netanyahu and Palestinian President Mahmoud Abbas, who remain "as determined as ever" to negotiate a peace deal, he said. We are "closer than ever" to realizing a two-state solution, he added. "I think it's possible in the next several months to arrive at a framework that does not address every single detail, but gets us to a point where everybody recognizes better to move forward than move backwards," Obama told Haim Saban, an Israeli-American media mogul who hosted the president for a public Q&A. "I think that we're now at a place where we can achieve a two-state solution in which Israelis and Palestinians are living side-by-side in peace and security, but it's going to require some very tough decisions," he continued. Some very tough decisions that make up the bulk of negotiations from here on. As Kerry pointed out, the basic outline of a deal has been clear all along: It must deal with borders, security, refugees, Jerusalem, mutual recognition and end of claims. But reaching a consensus on those issues will take a lot of work, and Obama reminded his audience that there is only so much the U.S. can do. "The only way this is going to be resolved is if the people of Israel and the Palestinian people make a determination that their futures and the futures of their children and grandchildren will be better off with peace than with conflict," he said. "The U.S. can be an effective facilitator of that negotiation and dialogue. We can help to bridge differences and bridge gaps. But both sides have to want to get there." One aspect of that facilitation was an extensive security plan written by American military commanders for their Israeli counterparts. Headed by retired four-star Gen. John Allen, whose last assignment was as top brass in Afghanistan, the in-depth analysis reports on how Israel can maintain its security in a two-state solution - a concern that has impeded negotiations in the past. On the Palestinian side, both Obama and Kerry made assurances not only that their most basic demands would be met, but also that a new Palestine could emerge, one that was a true partner to Israel. "Israel and Jordan must know that they will have a reliable and responsible neighbor, not a failed state between them," said Kerry. Obama went into further detail, discussing an interim deal that would initially only include the West Bank, not Gaza. Once Gazans saw the success, he argued, they would push for their own peace. "If there is a model where young Palestinians in Gaza are looking and seeing that in the West Bank, Palestinians are able to live in dignity, with self-determination, and suddenly their economy is booming and trade is taking place... that’s something that the young people of Gaza are going to want," he said. For all the talk of meeting Israel and Palestine's needs, though, Obama and Kerry seemed clear-eyed about the challenges ahead, including a transition period where Israel might have to yield some of its security demands and Palestine might be required to show restraint and patience. But four months into a nine-month deadline set by Kerry, Israelis and Palestinians have little tangible progress. At least now, they also have what looks like increased attention from Washington. –CNN's Elise Labott and Conor Finnegan contributed to this report. It's all about the illusion of achievement people. As in Syria, Obama is desperately trying to kick the Iranian can down the road and into the lap of the next President. He simply does NOT have the leadership qualities to lead the country into a war (as shown in Syria) so he is trying desperately to give the Iranians whatever they want to keep them contained until it all blows up in the face of the next USA president, most likely a Republican after 8 years of this left wing Democrat failure. And then the Democrats will blame the new President, just like they did when they blamed Bush for the financial disaster that the Democrats created with their homes for anybody and everybody, repayment optional homes program. We've seen this movie many times before. Did you not pay attention to our last president? Mr. Bush could barely read let alone looking down every other word at his written speech. He was a terrible speaker. Well Donna, I believe that the housing bubble did start before Bush, he just put it in overdrive. And lets not forget two un-budgeted wars, medicare (un-budgeted) Part D, and totally unbelievable tax breaks during a time of war. Tell me was the movie you watched made by looney tunes, or are you just making the facts up as you go. This economic disaster belongs to Georgie W, and all the make believe in the world will not change it. I do not believe the man or woman has been born yet who could have fixed mess he left in 15 years, much less five. You are correct, those of us that live in the real world have seen this movie, and and it is one we will not forget, no matter how facts are rearranged for the GOTPs benefit. I am really going to have to start keeping a list of President Obama's accomplishments as there are just too many to keep in my head these days. well now that Iran got its way, its made the ME even more dangerous than ever.